There has been some heartland talk in America’s Dairyland this summer. Golf fans who tuned into U.S. Open coverage may have heard it mentioned when the masses were trying to define the style of Erin Hills in rural Wisconsin. Is it a links? It sure looked like a (British) Open Championship from the overhead views. Is it a prairie course? All that fescue with hardly any trees certainly played the part. And what about all those kettles and eskers left by glaciers? There might not be another course in America that accentuates such natural characteristics. In the end, when the pundits and main characters had spoken, it seemed “heartland” was the choice. Built on large humps and depressions of a former farm destined to be a golf course, Erin Hills is a heartland course. That term, however, is not to be confused with heathland, which defines America’s top new golf resort, Sand Valley. The sand pit of sorts in central Wisconsin celebrated its grand opening this past spring after a former pine plantation was restored to its barren, sandy state. Since the opening of the Bill Coore and Ben Crenshaw design, new lodging options, a clubhouse, and dining have opened on property. The resort’s second course, Mammoth Dunes, is scheduled to open in 2018. Other courses could follow on the sprawling landscape. Until then, there is plenty of great golf within an hour’s drive to fill out a golf trip to central Wisconsin. A name like Bull’s Eye seems appropriate for a golf course smack dab in the middle of the state. But central Wisconsin’s best private course was actually named after the logging history in the Wisconsin Rapids area. Where the clubhouse now sits was once known as “Bull’s Eye Bend,” a turn in the Wisconsin River that was a guiding point for the transportation of logs. On less windy days with little golf course chatter, golfers playing the back nine can hear the rapidly running water from a nearby dam on the Wisconsin River. Three holes actually run along the banks of the river though all 18 holes are tree-lined. In that way Bull’s Eye (www.bullseyecountryclub.com), established in 1922, represents a classic Wisconsin parkland layout. At just over 6,600 yards from the back tees there are a handful of layup holes and several cross bunkers that need to be managed. On the drive into Bull’s Eye through a neighborhood, golfers might notice another golf course to their left. The nine-hole Tri-City Golf Course – owned by Bull’s Eye – was once part of the original course until it expanded in 1968. It plays shorter but offers an additional nine holes without leaving the site. Nearby Stevens Point Country Club (about 23 miles northeast) is in the midst of a transformative year. The club is putting the finishing touches on an approximate $6 million renovation of its facilities including the clubhouse and golf shop, pool and tennis courts. About half of the money was spent on golf course renovations which included restoration of the boundaries of many holes, new tee boxes, new irrigation and bunker renovation. There are even three new holes including the short 10th, a par-4 with a large dip in the fairway and trouble on both sides. A well-placed draw off the tee for a right-handed player might even reach the green. The par-3 No. 17, a short-iron play for most, has also come to life through renovation. It resembles a little bit of Pine Valley, a course regarded as the best in America. There are also other holes where sandy areas have been restored giving Stevens Point CC a Sand Valley look in portions, much different than the bare, tall pine tree-feel that it once had. The man who helped discover the land at Sand Valley as a potential golf site, Craig Haltom of the Oliphant Companies, led the course renovations. Including Stevens Point CC (www.stevenspointcountryclub.com), Oliphant lists five courses in central Wisconsin as clients plus two more in the Midwest (The Freeport Club in Illinois and Frankfort Municipal in Indiana) among many other projects around the nation. Public-access SentryWorld in Stevens Point knows what its private neighbor is going through. After full-scale renovations closed the course for nearly two years it re-opened in 2015 to rave reviews, shooting up the current Golf Digest rankings of the top 100 public courses in America (No. 34 after not being ranked). SentryWorld, a Robert Trent Jones Jr. original and renovation, was the start of prime-time golfing in Wisconsin when it opened 35 years ago. The recent changes have taken it into an elite category with superior course conditions and newly-created holes that were added to the new routing. Sorbo is the head golf professional at Lake Arrowhead in Nekoosa. Visitors from outside Wisconsin might not realize that literally just across the street from Sand Valley is a four-and-a-half star golf property – home to the 18-hole Lakes and Pines courses. Arguably one of the top three 36-hole properties in the state resides in the traditional tourist town of Green Lake, 90 minutes southeast of Nekoosa. The Golf Courses of Lawsonia present two wonderfully different canvases that are best played on the same summer day. A morning round on the Links 18 where the dew burns off more quickly can be mystical with a little fog in the air. The 1930 William Langford and Theodore Moreau layout has been restored to its mainly treeless origin in recent years. The course is a museum to yesteryear golf architecture with its flat bunkers fronted by steep faces and massive raised putting surfaces with large yet gradual undulations. Golfers who miss a green might be staring up at the horizon, not the flagstick. The famous par-3 seventh green is a great example where legend has it that a boxcar is buried underneath. A late afternoon or evening round on the Woodlands 18 can cast long shadows and some much needed shade on a hot sunny day. Cut through a forested area it was built in the 1980s with much more classic bunkering and target golf than the Links. The first three holes set the stage for precise iron play and proper club selection with a winding par-5, a short par-4, and a cliff par-3. 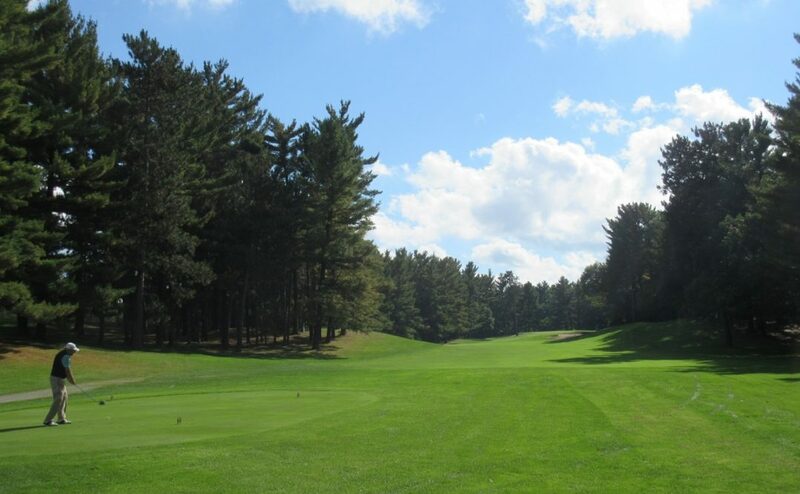 For more information on the Golf Courses of Lawsonia, visit www.lawsonia.com.